I am thrilled to be reviewing Room in Your Heart, one of two books that Kitaab World, a website which provides valuable resources and sells books about South Asia, has published. This debut picture book is a wonderful introduction to the little-known country of Bhutan – a country which has much to teach the world. Room in Your Heart is a folktale which provides the reader with glimpses into some of the cultural elements of Bhutan while also demonstrating global messages. The text is minimal and simple. The soft colors of the illustrations evoke the dreamlike world of a time long ago. The end-notes of the book include additional information about Bhutan. This book is quite versatile because it can be used to teach a variety of topics – cultural aspects, geography, diversity, character development, and history to name a few. Room in Your Heart revolves around the virtue of hospitality – a central belief and practice in Bhutan – as well other universal messages including generosity, kindness, hospitality, sharing, caring, respect, and empathy. The main character, who exemplifies all these traits, is an old woman cooking a meager dinner in her humble home. Strangers, from varied backgrounds, come to her door looking for food and shelter on a cold winter’s night. Even though the woman’s home is small and her food scant, she graciously welcomes all the strangers in to warm up and eat. They gratefully share the space and food despite their differences. 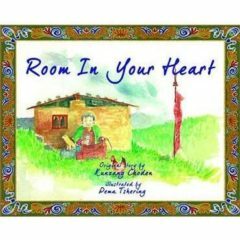 Room in Your Heart tells a story, emphasizes universal messages, and provides a glimpse into the country of Bhutan. It can be used to teach across the curriculum – a feature I always seek in books. I highly recommend this book! Congratulations to Kitaab World for producing such a remarkable book. I am looking forward to further quality publications from Kitaab World Publisher!